Nike Inc.’s marketing mix (4Ps) determines the profitability and growth of the athletic footwear, apparel, and equipment business. A company’s marketing mix refers to the strategies and tactics applied to execute the marketing plan, with focus on products, place, promotion, and price (the 4Ps). In this business case, Nike has a marketing mix that involves athletic products. For example, the company specializes in shoes that are designed to satisfy the needs of professional basketball and football athletes. However, these products are marketed to all consumers around the world, for athletic and leisure activities, based on the specifics of Nike’s corporate mission and vision statements. Established in 1964, the company’s 4Ps evolve according to the dynamics of the global sporting goods industry. Such evolution is a critical success factor that enables the business to use its marketing mix to respond to market trends and changes that influence local, regional, and international market demand for its products. Through its marketing mix, Nike Inc. strengthens its capabilities to protect its business from the strong force of competition. The company competes against various firms involved in the footwear, apparel, and athletic equipment markets. For example, the business operates in the same markets as Adidas, Puma, Under Armour, ASICS, and VF Corporation. The Porter’s Five Forces analysis of Nike Inc. shows that these firms exert a strong competitive force in the industry environment. 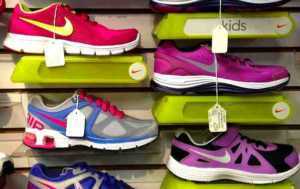 Shoes are the most popular products from Nike Inc. The business gradually adds more product lines in this category. For example, the company now offers running shoes, tennis shoes, and shoes for a variety of other sports, including cricket. Nike also sells apparel, such as jerseys, shorts, and related products. In addition, the company’s product lines include accessories and equipment, such as golf clubs. These products are available under a number of the company’s brands, including Air Jordan, Hurley, and Converse. Based on this element of the marketing mix, Nike expands its product mix to address the needs of its target markets and market segments. Retail stores are the most significant places where Nike products are sold because these venues are strategically located and easily accessible in various markets around the world. These retailers include large firms like Walmart (see Walmart’s Marketing Mix or 4P), as well as small local and regional stores. This 4P element also shows that customers can purchase Nike’s sports shoes, apparel, and equipment through the company’s online store. In addition, the business operates its Niketown retail outlets. These outlets are company-owned and allow access to business and market information that supports corporate strategic management with regard to marketing strategies and tactics for current, new, and emerging products. Based on this element of the marketing mix, Nike Inc. controls the distribution and sale of its products, especially through its online store and Niketown retail outlets. However, the company has limited control on the distribution and sale of its products via other retail outlets. Advertising is one of the biggest contributors to Nike’s ability to attract customers. The company heavily relies on advertisements, especially those that involve high-profile celebrity endorsers, such as professional athletes and sports teams. This element of the company’s marketing mix also includes personal selling through sales personnel who persuade target consumers to buy the company’s products. For example, sales personnel at Niketown retail outlets are trained to use such persuasion. The company’s direct marketing activities involve direct communications with colleges, local sports teams, and other organizations. In the context of the 4Ps, direct marketing refers to direct contact with organizations for the purpose of promoting products to the members of such organizations. In addition, Nike occasionally applies discounts and special offers to attract more customers and generate more sales. These discounts and offers form the company’s sales promotions tactics. Moreover, in public relations, the company sponsors and provides financial support to other organizations, such as community-based networks, to promote its athletic shoes, apparel, and equipment. Based on the tactics included in this element of Nike’s marketing mix, the business depends on its relations with high-profile endorsers to succeed in promoting its business and products to the international sporting goods market. In using the value-based pricing strategy, Nike Inc. considers consumer perception about the value of its products. In the context of the marketing mix, this value is used to determine the maximum prices that consumers are willing to pay for the company’s sports shoes, apparel, and equipment. In relation, the premium pricing strategy involves high prices, based on a premium branding strategy that establishes Nike products as higher in quality and value than competing products. The company’s use of advertisements involving high-profile celebrity endorsers is indicative of such emphasis on premium branding. In 2014, the business successfully increased its selling prices and generated higher sales and revenues. This trend continues, as the company enjoys increasing sales revenues while gradually increasing its prices. Based on the PESTEL/PESTLE analysis of Nike Inc., such trend is linked to the sociocultural and economic changes in the industry environment. The business adjusts its price ranges according to such changes. In this element of the marketing mix, Nike Inc. successfully uses its pricing strategies to maximize its profits while emphasizing high value in promoting its products and brand. Dominici, G. (2009). From marketing mix to e-marketing mix: A literature overview and classification. International Journal of Business and Management, 4(9), 17-24. Goi, C. L. (2009). A review of marketing mix: 4Ps or more? International Journal of Marketing Studies, 1(1), 2. Nike Inc. – Online Store. Rahmani, K., Emamisaleh, K., & Yadegari, R. (2015). Quality Function Deployment and New Product Development with a focus on Marketing Mix 4P model. Asian Journal of Research in Marketing, 4(2), 98-108. Van Waterschoot, W., & Van den Bulte, C. (1992). The 4P classification of the marketing mix revisited. The Journal of Marketing, 83-93. Yun-sheng, W. (2001). Perfection and innovation of 4P Marketing Mix – How to evaluate 4P Marketing Mix. Commercial Research, 5, 6.